Looking for a little more inspiration before jumping in? With the SpatialOS Game Development Kit (GDK) for Unity, you can quickly and easily build and host Unity multiplayer games. These games can use multiple server-side game engines across one seamless world to create new kinds of gameplay. The GDK Core: a performant, data-oriented integration with our cloud platform SpatialOS, based on the familiar Unity-native workflows. 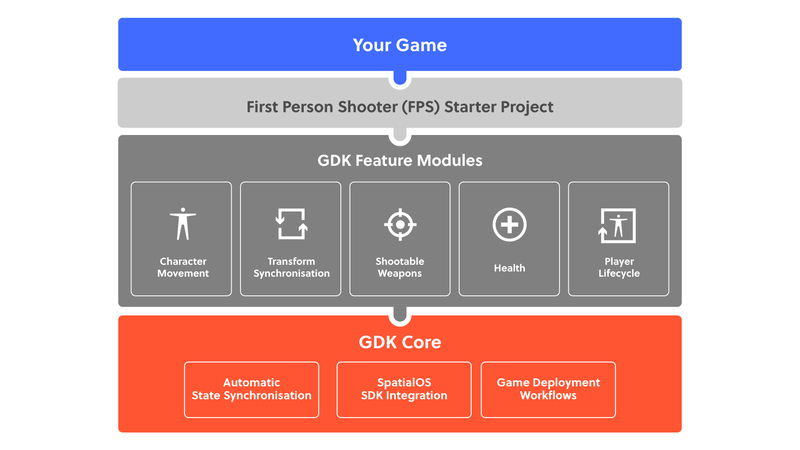 The GDK Feature Modules: a library of solutions for hard or common networked game development problems, such as Character Movement and Shooting. With the First Person Shooter (FPS) Starter Project you and your friends can experience the true scale of SpatialOS, providing a solid foundation for entirely new games. The Blank Starter Project contains the minimum GDK feature set you need to start developing games for SpatialOS. Check out our blogs on SpatialOS games currently in development and the game design opportunities and challenges associated with working with SpatialOS. We’d love to hear your game ideas and answer any questions you have about making games on SpatialOS. Join the community on our forums, or on Discord. If you aren’t already familiar with SpatialOS, you can find out about the concepts which enable it to support game worlds with more persistence, scale, and complexity than previously possible. Read the SpatialOS concept docs on the SpatialOS documentation website (5 minute read). Find out what’s involved in getting started with our Get started with SpatialOS for Unity walk-through youtube video, based on our Get Started guide (15-minute watch). This is the alpha release of the SpatialOS GDK for Unity. We invite projects to start using it but warn that all APIs are subject to change as we learn from feedback.